June 2016 – Waterton Lakes National Park enchanted us. After all the grand and imposing majesty of the Canadian Rocky Mountains that we had seen in our RV trip on the other side of this mountain range at Banff and Jasper National Parks, there was an intimacy, charm and quiet elegance to Waterton Lakes that was very refreshing. 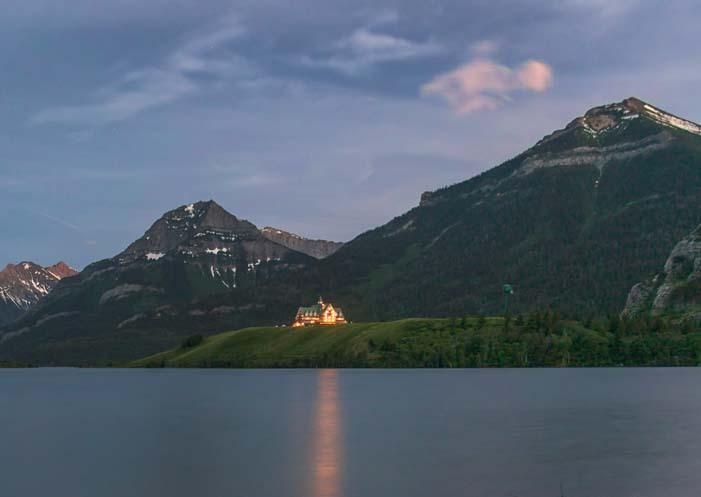 Waterton Lakes National Park… Stunning! 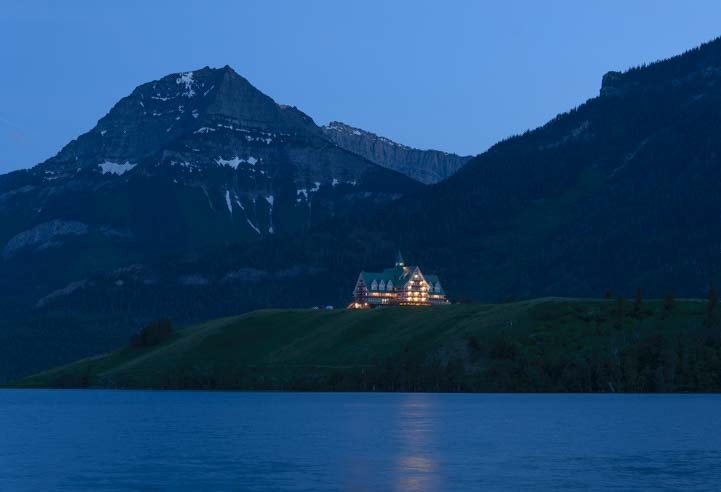 The Prince of Wales Hotel really sets the stage for this special feeling at Waterton Lakes. We snuck down to the water’s edge one evening to get some photos of it reflecting its inviting warmth onto the lake. The Prince of Wales Hotel has an inviting glow at night. How rare it is to find this unique combination of natural beauty juxtaposed with man-made beauty in a National Park. 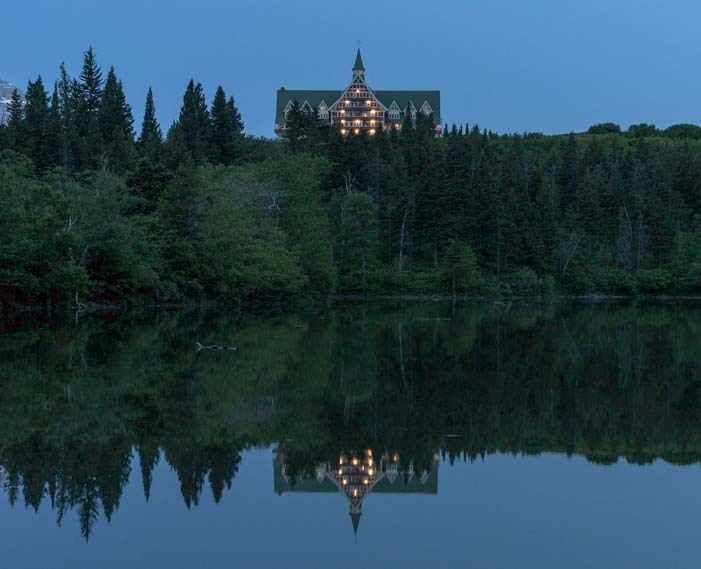 There was something about that hotel glowing across the water that just looked so appealing. It must be quite a place to stay! 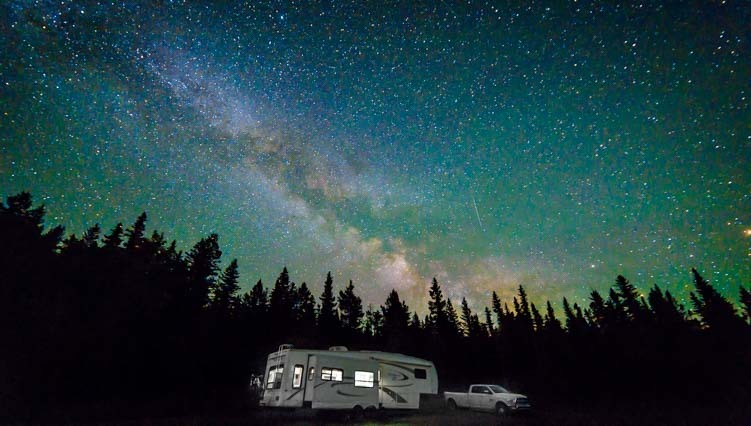 One thing we discovered quickly is that the night skies in Waterton Lakes National Park are extremely dark and absolutely jam packed with stars. The park is 35 miles away from the nearest “big” town, and by “big” I mean 3,700 people. So there aren’t any city lights to block out the view of the stars. We crept out in the wee hours of the morning one night and got a quick pic of the buggy hanging out under the Milky Way. Wow!! Our buggy loves camping under the Milky Way! This gave me an idea to set up a time-lapse video showing the Milky Way moving across the sky. Watching the result after I woke up in the morning was a total thrill! So I did it again the next night and again the next. I combined all three nights into one 36 second video (below) which is very cool. The first two sequences in the video show the movement of the stars between an hour after sunset and an hour before sunrise, revealing the entire night passage of the Milky Way on two different nights. Since it was mid-June, we were nearly at the Summer Solistice, and because we were above the 49th parallel, the nights were darn short! So, the time-lapse videos from each night run from 11:45 pm until 4:15 am. There’s not much nighttime in those parts at that time of year!! The third overnight sequence in this time-lapse video captures a bit of the Northern Lights playing in the sky for a short while just after midnight. Then, suddenly, the sky clears and you can see the Milky Way’s march across the sky that goes on all the time as our planet does its pirouettes across the heavens. Shortly after we had all this fun capturing the Milky Way in still images and time-lapse videos, we read an article that said that 80% of the earth’s inhabitants have never had the good fortune to see the Milky Way, because our night skies all around the world are so full of artificial light. The article went on to say that during a city-wide power outage in 1994 in Los Angeles which was caused by the huge Northridge earthquake, the police got calls from frightened residents claiming there was a big scary silvery cloud hovering overhead! As the time went by during our stay in gorgeous Waterton Lakes National Park, we found our days were action packed. Besides taking the wonderful Waterton Shoreline Cruise on the historic ship MV International along the length of the park from Waterton down to Glacier National Park in Montana and back (blog post here), we also got out on our bikes on the fabulous paved trail that wanders along the water and out of town a ways. We loved the paved bike paths (and walking/running trails) around Waterton Lakes. What a fantastic trail this is. The mountains soared into the sky all around us. Mark rode off ahead of me into the pages of a cycling brochure! It is a fun, rolling ride that has a few tight turns. 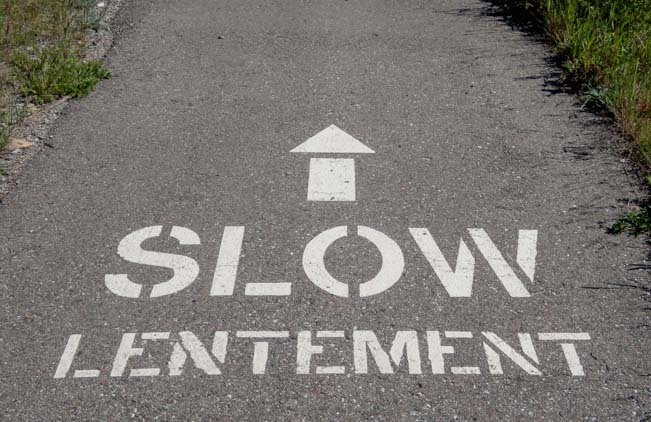 Reminders on the pavement — in French as well as English — kept us from going too fast!! It was fun seeing official signs in French as well as English, even on the pavement. We ran on this trail and walked on it too. We never got tired of the views! There’s great cycling on the roads as well, and we saw some cycling groups going by. This is a fairly remote place, so the traffic on the roads was pretty light, making for some great road riding. The roads around Waterton Lakes National Park are great for cycling too. 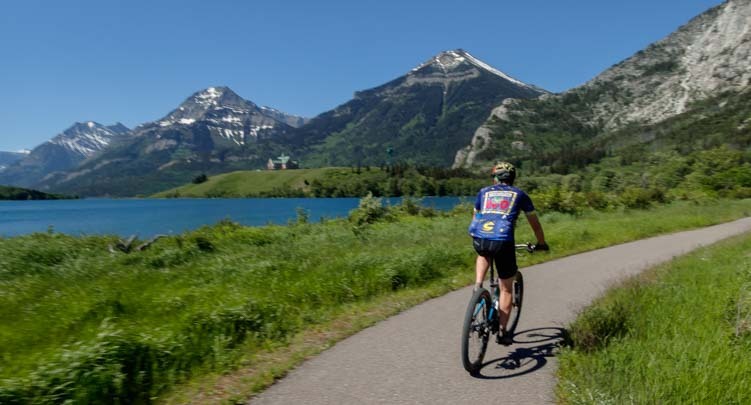 But Waterton Lakes can be enjoyed by other means besides a shoreline cruise on a boat or a bike ride. We saw a group of horseback riders out enjoying the views too! 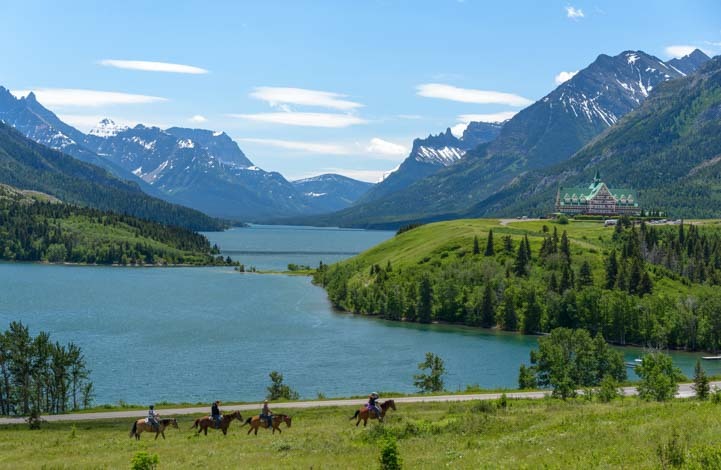 A group on horseback took in the views across Upper Waterton Lake. The Red Rock Parkway is one of the main roads in Waterton Lakes, but it was closed for most of our time there. It did open on the weekends, though, and we had a chance to drive this wonderful scenic drive one Sunday. The Red Rock Parkway took us into more distant parts of the park. It’s a very pretty drive, and at the end is lovely Red Rock Canyon. 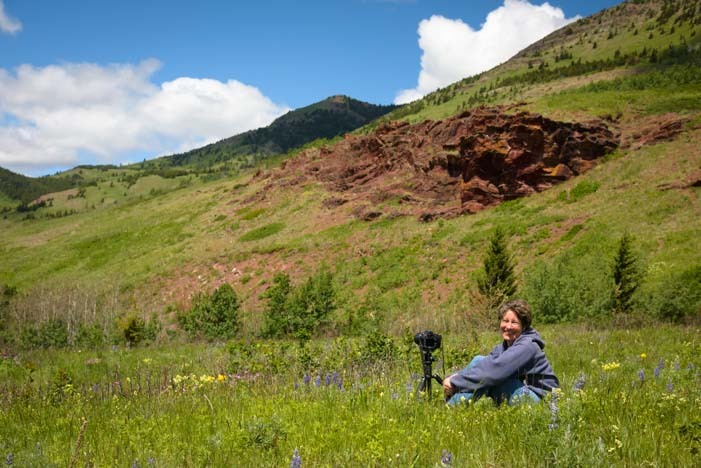 It is a neat surprise to see red rocks amid all this green and blue scenery! 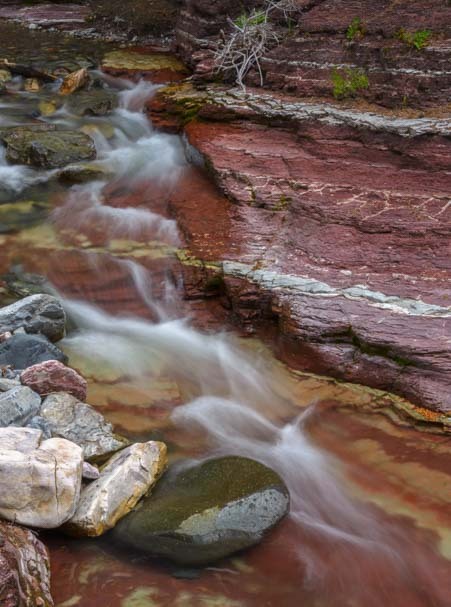 There was a thin stream of water flowing down the rocks, and we caught it in silky slow motion. Red Rock Canyon was a pretty place to explore. What we really wanted to see, though, was wildflowers, and these were scattered along the meadows on either side of Red Rock Parkway. 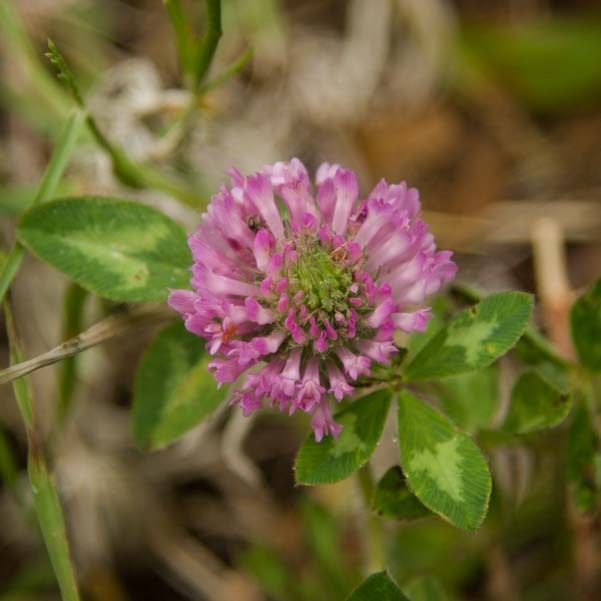 We didn’t see huge fields of them, but instead we found tiny individual flowers of all different kinds. 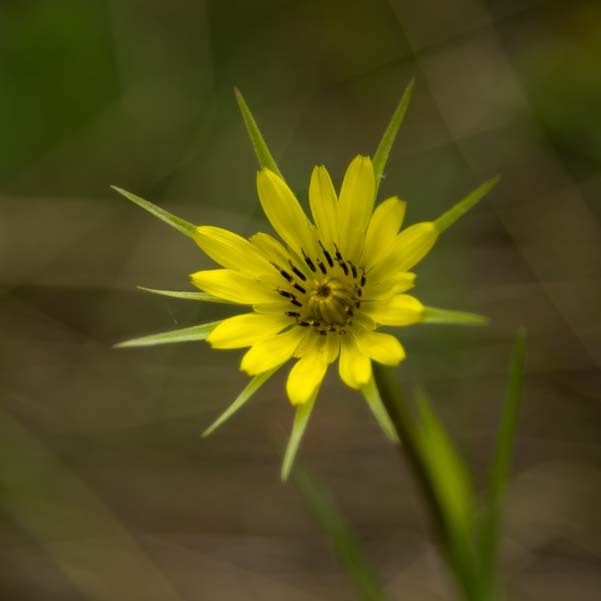 We found a pretty little wildflower looking up at the sun. Some of these were just the size of the end of my finger, and they were really delicate too. 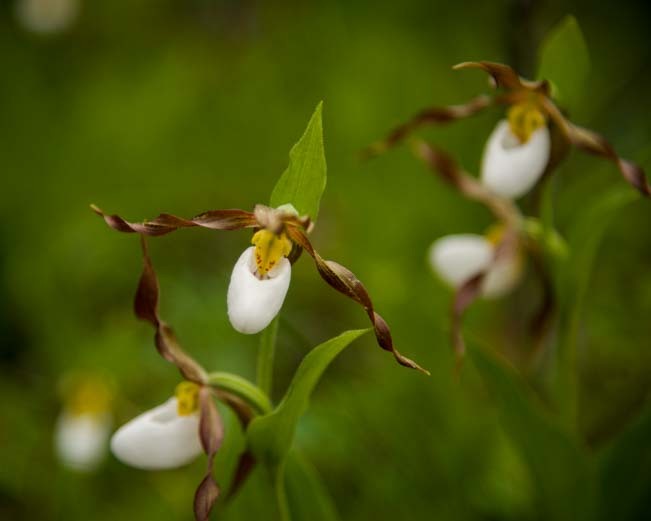 Mark discovered a little bed of lady slipper flowers. I’m used to these guys being fairly big (and pink! ), but the tiny white ones he found were the size of a marble, if that. I loved the twisted pairs of ribboned leaves on each one. 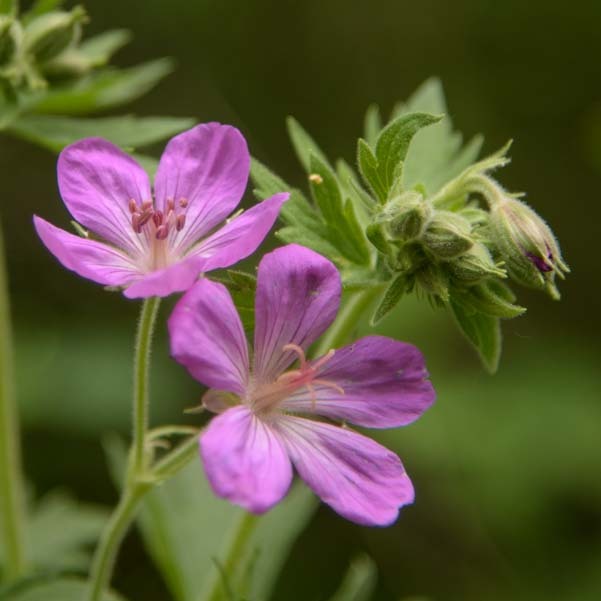 They were like the satin ribbons on ballet slippers… for Thumbelina or Tinkerbell! 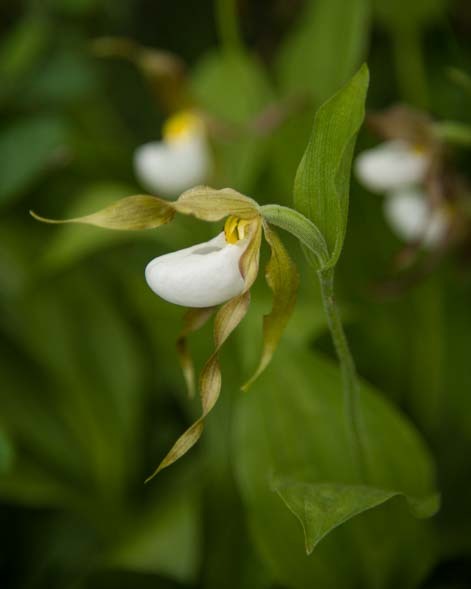 This tiny lady slipper is so small only Thumbelina’s foot could fit! Ladyslippers… and ribbon leaves to tie them with. 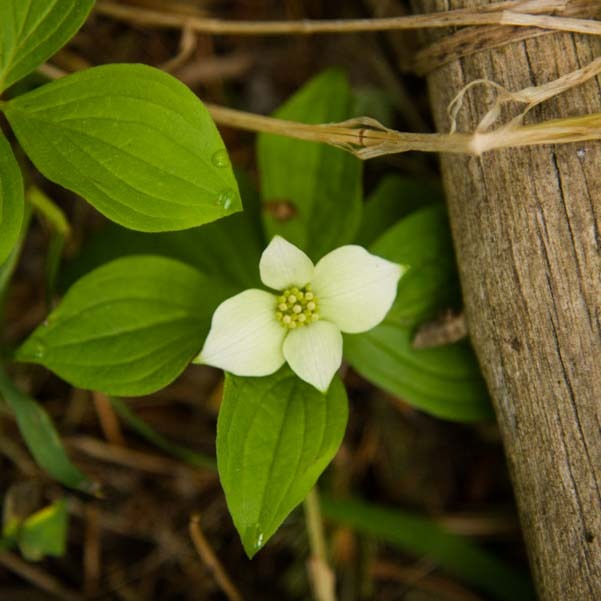 We found Bear Grass and cheerful yellow daisies and more. 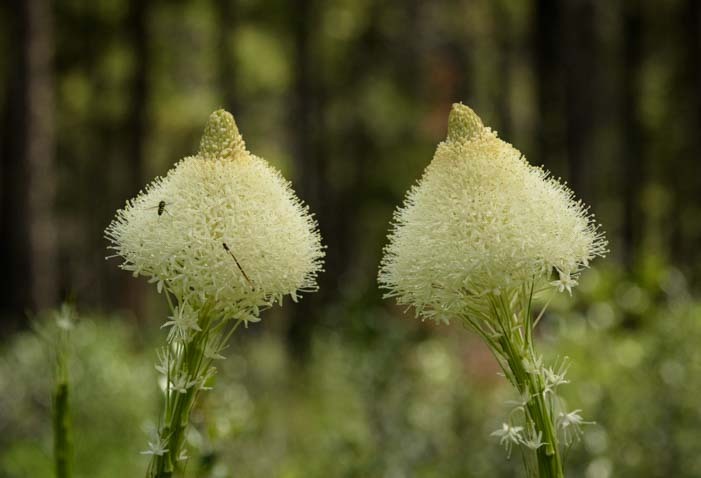 Bear grass was blooming everywhere. 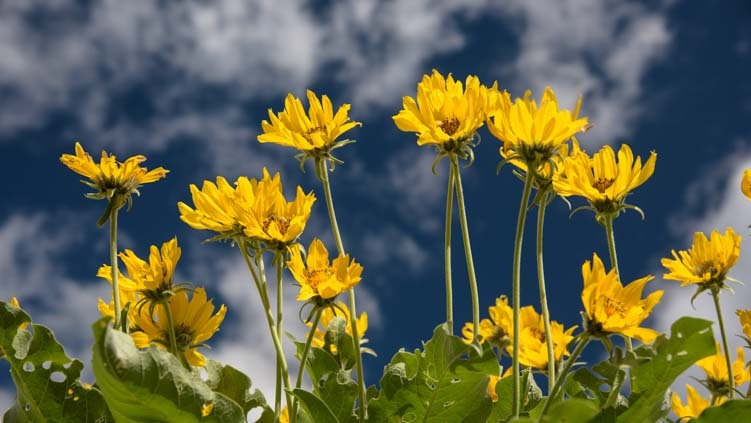 Some yellow daisies warm their petals in the sun. We were both in our element for a few hours sitting amid the flowers in the meadows. 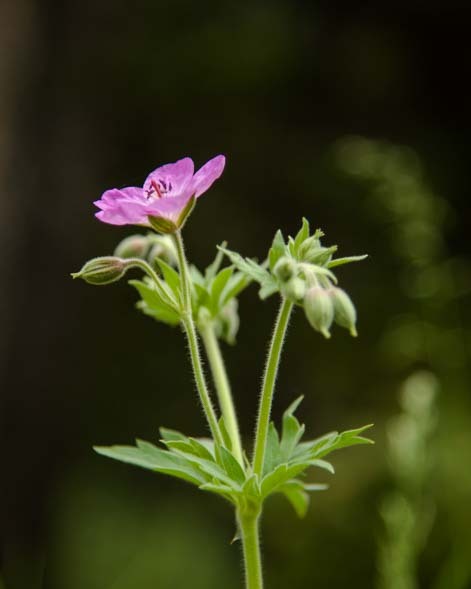 I know there are great hikes out on the Red Rock Parkway, but we couldn’t tear ourselves away from this little dollhouse world of flowers. 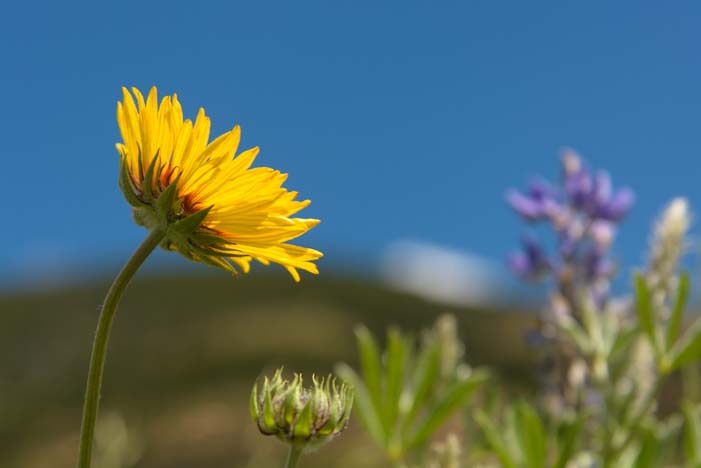 We didn’t get much hiking or exercise in, but communing with the wildflowers sure was fun. 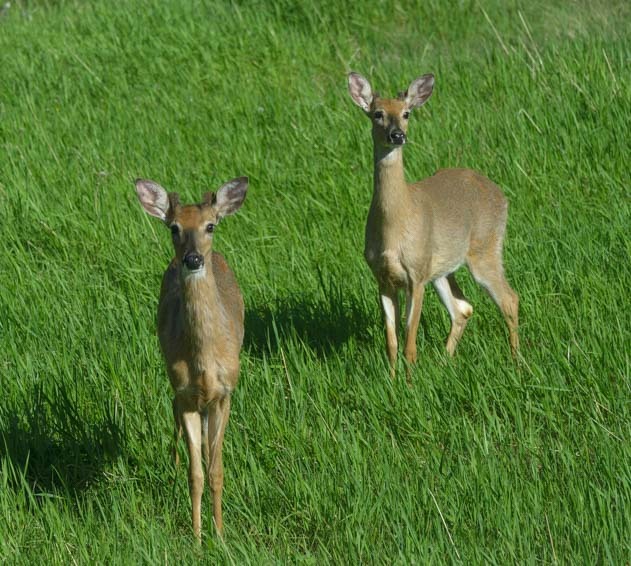 When we returned to town we were greeted by a pair of friendly deer. The fearless and ever so curious deer at Waterton Lakes were a highlight for us! 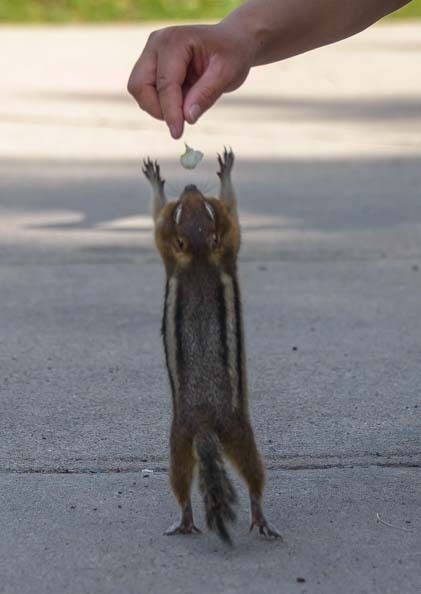 And a chipmunk showed us just how tall he could stand when there was a prize to be had. This little chipmunk did tricks for us. 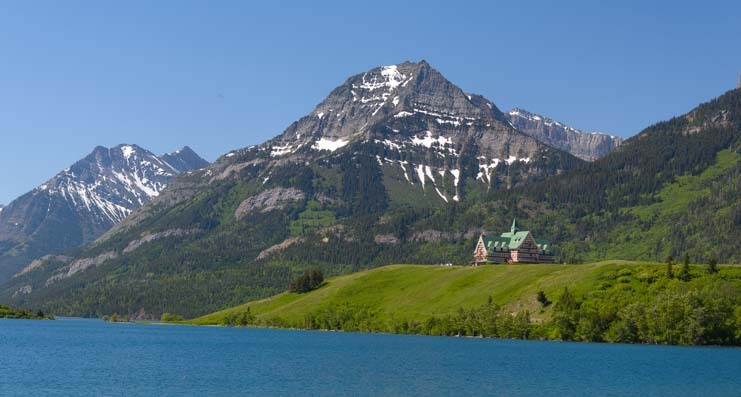 Waterton Lakes National Park is a really special destination, and it’s ideal for an RV trip. 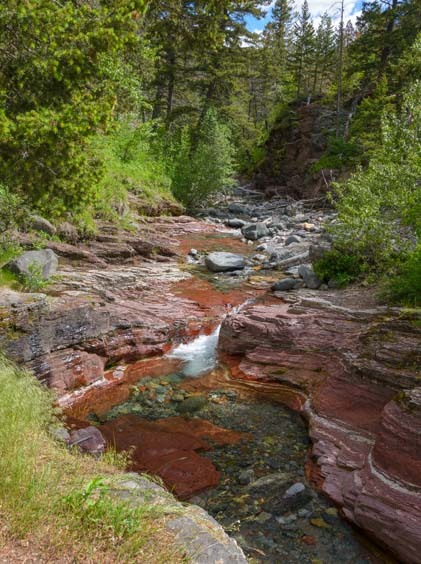 There’s a big campground with a variety of amenities in town and it’s just a stone’s throw over the border from the east side of Glacier National Park in Montana! 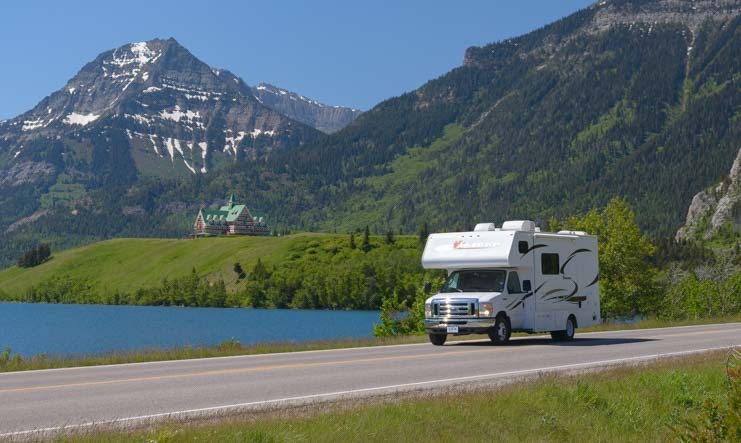 Waterton Lakes National Park is a wonderful destination for an RV trip!! 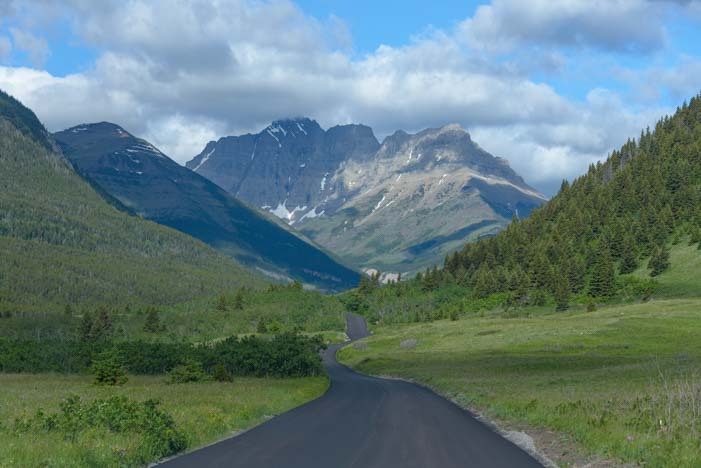 If you are planning an RV road trip to Waterton Lakes, there are more tips and links below. This entry was posted in Canada and tagged Canada, Canadian Rockies, Milky Way, National Parks Canada, New, Night Hikes, Time-lapse Video, Travel, Waterton-Glacier National Park, WP Travel by Roads Less Traveled. Bookmark the permalink. THANK YOU FOR LETTING US TRAVEL WITH YOU !!!!!!!!!!!!!!!!!!!!!!!!!!!!!!!!!!!!!!!!!!!!!!!!!!!!!!!!!!!!!!!!!!!!!!!!!!!!!!!!!!!!!!!!!!!!!!! You are so very welcome!!!!!!!!! You live in a gorgeous part of the country, and time-lapse videos any time of day or night would be fantastic. I did a time-lapse of a waterfall on the Going the the Sun Road that was pretty cool too. Our Milky Way time-lapse photos are 30 second exposures about 35 to 50 seconds apart. The closer together, the faster the Milky Way moves, of course. Have fun in your travels and thanks for reading! !